Made in Italy and exported to more than 80 countries! This laboratory includes various modules to experiment circuits and principles recurrent in the field of Electricity. They are recommended for students attending any subsequent electrical and electronics speciality. The laboratory consists of an integrated set of training modules commonly recurrent in the field of Electrical Installations, in metal housings (or isolated boxes) with clear synoptic depicting the inside logic. This laboratory has the objective of teaching the techniques for correct, professional implementation of residential and industrial electrical circuits. This laboratory simulates a real life generation, transmission and utilization system based on standard electrical machines, instruments and a simulated transmission line. The laboratory includes kits and accessories to build, repair and test three phase AC motors and transformers for maintenance and repair technicians. This laboratory provides effective training in testing electrical machines by offering complete range of integrated AC and DC units in the 0,2 KW to 10 Kw power range. The laboratory equipment includes various modules to show and experiment circuits and principles commonly recurrent in the field of Basic Electronics up to Microelectronics. This laboratory includes various modules to experiment circuits and principles commonly recurrent in the field of power electronics, transducers and controls. The laboratory is conceived to give the student a clear overview of the concepts involved in industrial automation. The laboratory includes various modules to show and experiment circuits and principles commonly recurrent in the field of telecommunications. The laboratory includes a collection of training unit covering all the most important subjects of Electronics maintenance, especially suited for installation and maintenance engineers. The hardware solutions, together with increasing software support, help technical institutions and laboratory teachers in more than 70 countries in the world to work better, faster, and with a lower budget. Sophisticated technologies are skilfully implemented in friendly and easy to use training equipment. 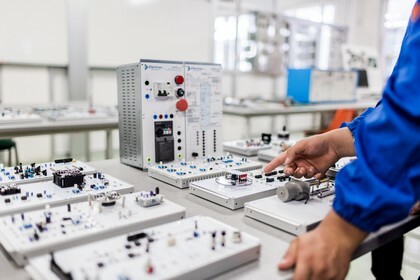 The production range is one of the widest on the market and covers almost all Electronics and Electrical training subjects, including Telecommunications, Industrial Automation and Mechatronics, from basic principles to state of the art computer based trainers.